A chair massage is a 5-20 minute massage that focuses on the high tension areas of the neck, back, shoulders, arms, and hands. 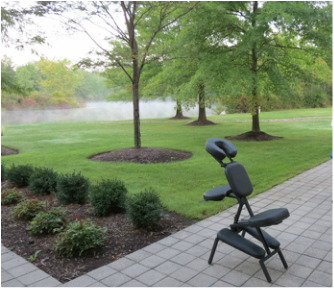 The massage is performed while seated on an ergonomically designed, portable massage chair. As this modality allows you to remain fully clothed, it is ideal for public settings. *With all options, the Company or individual retaining the massage service (You) will be responsible for payment in full. Any required payment from attendees may either be pre-paid, or recouped at your discretion. * 50% deposit required to secure the event, with balance due day of visit. Massage is a great marketing tool to attract prospective clients at big events. Most employees would prefer a massage as opposed to the usual generic gifts, just ask! Please include such information as dates, times, number of employees/guests, and for what type of event chair massage is needed. * 50% deposit required to secure the event, with balance due day of visit. Deposit is refundable up to 72 hours before the date of the scheduled visit, 50% refundable after 72 hours, and can be paid via phone or invoice. ﻿﻿All correspondence will be returned within 72 hours. You may also text me for a faster response 216-282-4329. Please include such information as dates and times, number of employees, and for what type of event chair massage is needed.﻿﻿ I look forward to working with you!